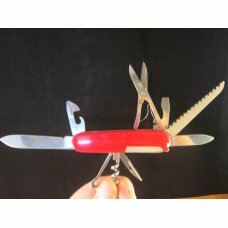 Victorinox Multi-Tool New in Box Never carried or sharpened Lot of Blades & Tools Look at photo's for more Description Thanks for looking..
Up for your consideration is the following pocket knife: INVENTORY #: 928 MAKER: Victorinox TOTAL # OF BLADES: 4 PATTERN: Multitool LENGTH CLOSED: 2..
Victorinox Soldier 4 Blade Metal Handle Swiss Army Knife new in box never carried or sharpened no wobble . Thanks for looking..
CRESCENT KNIFE WORKS on AAPK Handle - Black handle scales. Length closed - 3-5/8 inches. Condition - Unused and working perfectly. New in the box. S..
CRESCENT KNIFE WORKS on AAPK Handle - Gray handle scales. Length closed - 3-5/8 inches. Condition - Unused and working perfectly. New in the box. Se..
CRESCENT KNIFE WORKS on AAPK Handle - Red handle scales. Length closed - 4-3/8 inches. Condition - Unused and working perfectly. See pic's. 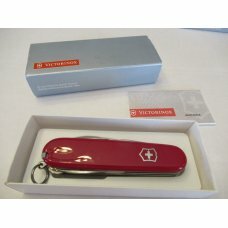 Made in..
We are pleased to offer this Victorinox Official Scout pocket knife in Mint Condition. 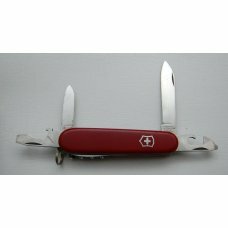 This 10-Blade 3 1/2" long pocket knife has wonderful Red Plast..
We are pleased to offer this Victorinox Official Scout pocket knife in Mint Condition. 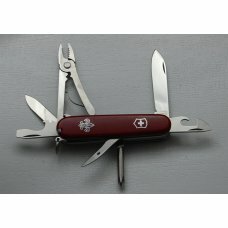 This 3-Blade 2 3/8" long pocket knife has wonderful Red Plasti..
We are pleased to offer this Victorinox Official Scout pocket knife in Mint Condition. 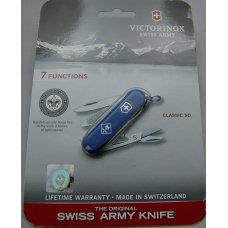 This 6-Blade 4 3/8" long pocket knife has wonderful Blue Plast..
We are pleased to offer this Victorinox Official Scout pocket knife in Mint Condition. 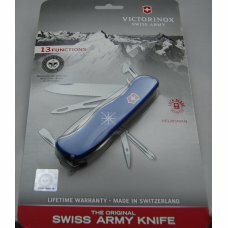 This 3-Blade 2 3/8" long pocket knife has wonderful Blue Plast..
We are pleased to offer this Victorinox Official Scout pocket knife in Mint Condition. 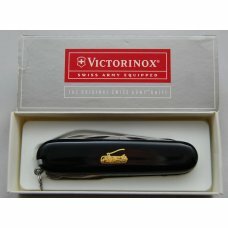 This 8-Blade 3 1/2" long pocket knife has wonderful Black Plas..
We are pleased to offer this Victorinox Vintage pocket knife in Excellent Condition. 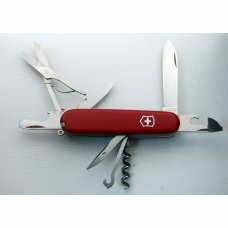 This 6-Blade 3 1/2" long pocket knife has wonderful Red Syntheti..
Victorinox Switzerland Stainless Rostfrei Red Officier Suisse Swiss Army Knife & Pouch - No Cracks in the Handles but they do have some Deep Scratches..
Victorinox Switzerland Stainless Rostfrei Red Recruit Officier Suisse Swiss Army Knife - NIB - No Cracks in the Handles - Snaps Open and Shut - No Wo..
Victorinox Switzerland Stainless Rostfrei Red Spartan Officier Suisse Swiss Army Knife - NIB - No Cracks in the Handles - Snaps Open and Shut - No Wo..
Swiss Army Victorinox New in Box Never Carried or sharpen Look at photo for more description Thanks for looking..
Victorinox Switzerland Stainless Rostfrei Mauser Green 5 Blade Folding Sportsman's Knife - Green Plastic Handles - No Cracks - Snaps Open and Shut - N..
MAKER: Victorinox PATTERN: Troubleshooter -similar to the Deluxe Tinker with an extra tool or two LENGTH (Closed): 91mm about 3.5” S..
Wenger Swiss Army Knife . Never carried or sharpened. Comes in metal tin with cover . Thanks for looking..
EKA Model 2-GSV New in Box made in Sweden Nice Executive Knife Don't know much about It . Thanks for looking..
EKA Classics Pocket Knives For Kings & Presidents Executive Model 1 GSV don't know a lot about these Nice art work front and back . 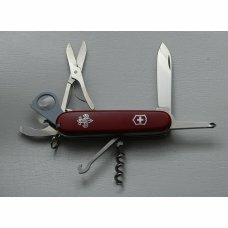 Made In Eskilst..
We are pleased to offer this Used Victorinox pocket knife with Smooth Red Synthetic Covers In Excellent Condition. 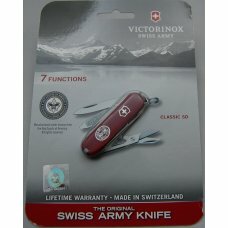 This economical knife is 3 9/16" lo..
Victorinox Swiss Made Mulit Tool New in Box Green Plactic Handles .Never toted or sharpened . Has light ,toothpick. 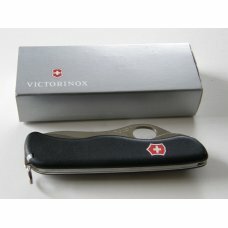 tweesers Punch ,2 phillips heads ..
Victorinox Lockback Hunter MAKER: Victorinox PATTERN: Locksmith LENGTH (Closed): 11 cm HANDLES: Plastic BLADES: It appears to h..
We are pleased to offer this Victorinox Official Scout pocket knife in Excellent Condition. 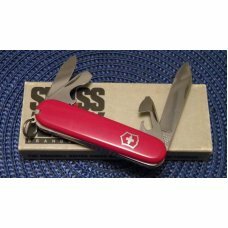 This 7+3-Blade 3 9/16" long pocket knife has wonderful Pl..
We are pleased to offer this Victorinox Official Scout pocket knife in Excellent Condition. 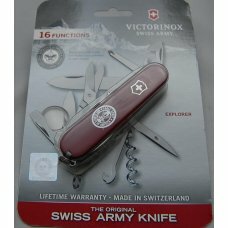 This 7+2-Blade 3 9/16" long pocket knife has wonderful Pl..
Victorinox Switzerland Stainless Rostfrei Diplomat Silver Alox Swiss Army Knife in Box - No Cracks in the Handles - Snaps Open and Shut - No Wobble - ..
Victorinox Switzerland Stainless Rostfrei Classic Gold Lip Pearl Swiss Army Knife - NIB - Gold Lip Pearl Handles - No Cracks - Snaps Open and Shut - N..
Victoria (Victorinox Switzerland) Red Fiber Abercrombie & Fitch Sportsmans Swiss Army Knife - Red Fiber Handles - Have a couple rivet cracks - Snaps O..
Elsener Schwyz (Victorinox Switzerland) Red Fiber Officers Swiss Army Knife - Stamped 39 on Rear Tang... I am assuming that means made in 1939? 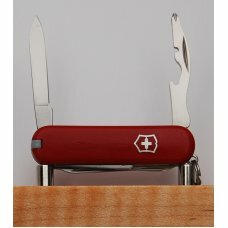 - Red ..
Victorinox Switzerland Stainless Rostfrei Red Companion Swiss Army Knife in Box - No Cracks in the Handles - Snaps Open and Shut - No Wobble - Near to..
Victorinox Switzerland Stainless Rostfrei Huntsman Swiss Army Knife + Sruvival Kit & Pouch - The Knife & Kit comes in a Leather Pouch and includes : L..
Victorinox Switzerland Stainless Rostfrei Swiss Champ Swiss Army Knife + SOS Kit & Pouch - The Swiss Champ comes in a Leather Pouch and includes 33 Fe..
Victorinox Switzerland Stainless Rostfrei Diplomat Silver Alox Swiss Army Knife - NIB - No Cracks in the Handles - Snaps Open and Shut - No Wobble - ..
Victorinox Switzerland Stainless Rostfrei Red Alox Pioneer Swiss Army Knife - NIB - Swiss Cross Shield - Keyring - Nickel Silver Center Liner - Red Al..
Victorinox Switzerland Stainless Rostfrei Swiss Champ Knife and Pouch Survival Kit SOS Set - The Swiss Champ comes in the Original Leather Sur..
Victorinox Switzerland Stainless Rostfrei Mauser Green 5 Blade Folding Knife - Green Plastic Handles - No Cracks but there are a few minor dings - Sna..
Victorinox Switzerland Stainless Rostfrei Mauser Green 5 Blade Folding Knife - Green Plastic Handles - No Cracks - Snaps Open and Shut - No Wobble - N..
Victorinox Switzerland Stainless Rostfrei Atlanta 1996 Olympic Games Swiss Army Type Knife - NIB - No Cracks in the Handles - Snaps Open and Shut - No..
Victorinox Switzerland Stainless Rostfrei Red Swisschamp Officier Suisse Swiss Army Knife - NIB - No Cracks in the Handles - Snaps Open and Shut - No..
Victorinox Switzerland Stainless Rostfrei Red Craftsman Officier Suisse Swiss Army Knife - NIB - No Cracks in the Handles - Snaps Open and Shut - No W..
Victorinox Switzerland Stainless Rostfrei Red Explorer Officier Suisse Swiss Army Knife - NIB - No Cracks in the Handles - Snaps Open and Shut - No W..
Victorinox Switzerland Stainless Rostfrei Classic Sterling Silver Barleycorn Swiss Army Knife - NIB - Sterling Silver Handles - No Cracks - Snaps Ope..
Victorinox Swiss Made Stainless Silver Alox Solo Pioneer Swiss Army Style Knife - NIB - No Cracks in the Handles - Snaps Open and Shut - No Wobble - N..
Victorinox Switzerland Stainless Rostfrei Silver Alox "Farmer" Swiss Army Knife - NIB - No Cracks in the Handles - Snaps Open and Shut - No Wobble - N..
Victorinox Switzerland Stainless Rostfrei Red Alox Sturdy Boy "Pioneer" Swiss Army Knife - NIB - Swiss Cross Shield - No Keyring - Brass Center Liner ..
Victorinox Switzerland Stainless Rostfrei Diplomat Silver Alox Swiss Army Knife - No Cracks in the Handles - Snaps Open and Shut - No Wobble - Near t..
Victorinox Switzerland Stainless Rostfrei Classic Sterling Silver Barleycorn Swiss Army Knife - Sterling Silver Handles - No Cracks - Snaps Open and ..